With an eye on entering aquascaping competitions, Nathan Hill tries his hand at a serious design. Here he introduces us all to 'Godzilla Sleeps'. If you're into the aquarium layout scene it's hard to avoid the looming spectre of competitive aquascaping. 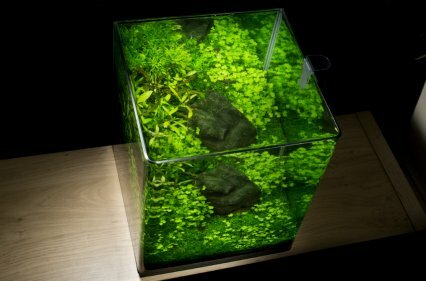 Not content with simply having an attractive tank in the home, more and more aquascapers are choosing to send images of their efforts to expert panelists in distant lands for their work to be judged and graded. After watching this curious phenomenon from afar for many years, I now feel compelled to get myself involved in it — just for the experience. The tank I've put together here was inspired by German aquascaper Volker Jochum who has appeared working under Dennerle's banner a few times and is a big-time contest winner in his own right. His influence on me has been quite revelatory in that his own layouts tend to be self-indulgent, opting to ignore some of the classic conventions of positioning hardscape. More importantly, however, his designs have the power to captivate, even in absence of any livestock. It's only after observing his tanks for a while that you realise that fish are more often than not missing! In my own set-up I've noted that an absence of fish has led to a proliferation of copepods and other freshwater planktonic forms, which have made it fascinating to watch close up. This aquarium, which I have decided to call 'Godzilla Sleeps' in the time-honoured tradition of naming aquascapes, is the product of around eight months of growing in. Over that period the initial outlay of plants has changed, the hardscape vanished in rapidly climbing growth and the layout is now very far removed from its starting point. 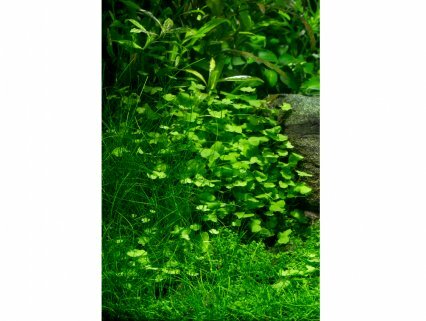 The next step is to submit images to various aquascape societies, sit back and wait. From my own perspective I like the tank, so any feedback from professional 'scapers will be a bonus. Am I worried about criticism? Not really. As I say, I like it as it is and someone telling me that I've positioned a rock incorrectly won't detract anything from my experience. The tank is a Fluval Flora 30l which I acquired for long-term testing many moons ago. For this project I have removed the standard T5 lighting and opted for an LED light I am trialling for Hagen. It's a Fluval Sea nano light at 14w which, although lacking the glare of the T5s, has given me better growth than I've had with the former. The light goes on for six hours in the morning and then goes off for four hours. The tank then gets another four hours of light late in the afternoon. Filtration is a JBL e-700 Profi-filter of the model we have previously ran as a magazine subscription offer, connected up to gUSH glassware both in and out. In line to that a ceramic CO2 diffuser is connected to the return pipe and fed from a 2kg fire extinguisher with a TMC solenoid and regulator turning the supply on and off. Substrate is 3 l. of TMC's Nutrasoil, topped off with nondescript sand that I had floating about from an earlier project. There are actually some seven or eight rocks in the display, but these have eventually grown over and only the main 'Godzilla' rock remains. The rock is imported Sea Mountain that I actually took from one of Volker Jochum's set-ups that he left with us when he last visited PFK. Gas goes in at a rate of around five bubbles per second. This is high, but I don't have livestock in the tank to worry about so can pull it off. Easycarbo goes in at a dose of 5ml daily. This eradicates any algae and, although there was a burst at the beginning, nuisance growth is negligible nowadays. Plant feeding is a mixture of EI salts, dosed at 5ml daily, as well as a weekly addition of the entire Aquavitro range of plant foods from Seachem at prescribed dosages. I tried various brands, but found this combination really brought out the greens of my foliage. Water changes take place weekly, at a rate of 50% or more at a time, with a tank clean, including brushing rocks with a toothbrush, at the same time. Total time spent weekly on the tank is about one hour, including trimming. I've added no fish, but if I were to do so then I'd opt for a pair of tiny Parosphromenus nagyi gourami, or similar.